Regular readers will know how much I love puzzles and games. I haven’t done that many game reviews on this blog, but I want to change that. I’ll be reviewing old and new games I’ve played. And not only video games! I’m going back to basics with board games and social games, cause some of these games are just as much fun (sometimes even more) as sitting behind a computer and killing each other (not that that’s the only thing you can do with video games). Plus I find not enough people play these type of games nowadays, which they should! To start this off, I’ve chosen Carcassonne, a board game I’ve been addicted to these past weeks. 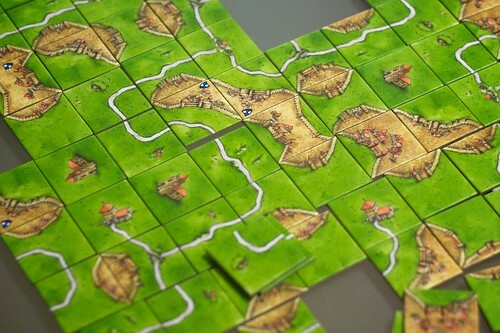 Carcassonne starts with a single tile in the middle of the table, portraying part of a medieval landscape. All other tiles are shuffled and placed face down in a stack. On each turn a player draws a tile and places it adjacent to another tile already on the table. Tiles must be placed in a logical way: roads must extend roads, fields to fields, cities to cities. Simple so far, right? Besides drawing and placing tiles, every player has seven ‘meeples’, wooden follower pieces to score points. After placing a tile, a player can decide to station a meeple on that tile. 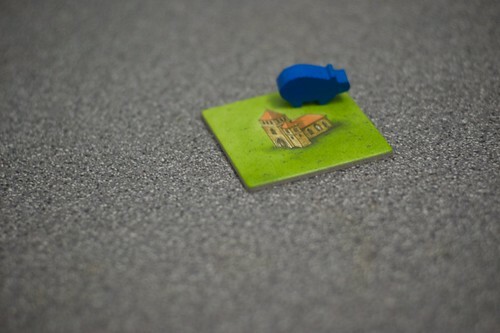 The meeple must be placed on a specific feature – road, city, field, cloister – and may not be placed if that feature has already been claimed. Whenever a feature is completed, a player scores points. The game ends when the last tile is played and the player with the most points wins. And that’s all there is to this game. The basics are so simple, you don’t really need a lengthy explanation to start playing. Kids will grasp the basics just as quick as adults and there aren’t a lot of rules to remember. The game play itself can be quite quick and easy, depending on who you’re playing against. The way we play it though, we tend to take ages trying to figure out what’s the “optimal” spot to place a tile. What I really love about this game though is the number of expansions available, each changing the game in unique ways. For example, the River expansions replaces the single start tile with a river of a couple tiles long (all that changes in game play is the amount of options at the start). With the King and Scout expansion, there is an extra set of points for the player with the largest city and largest road. I love the Traders and Builders expansion, cause it adds two special meeples: one to score extra points in the fields (in the form of a little pig, called affectionately a ‘peeple’), and one to be able to draw an extra tile per turn (a “builder”, so a ‘beeple’). I’m simplifying it a bit now, but each expansion creates a different dynamic to the game and by combining expansions you can tailor the game to exactly how you like it. If you like the sound of this definitely try out the basic set, or try to grab me at the next BarCampLondon. I’m going to bring it with me then to play during the overnight and maybe even do a session about it. Carcassonne (the basic set) is available on Amazon.co.uk for £14.95 and on Amazon.com for $22.87 .